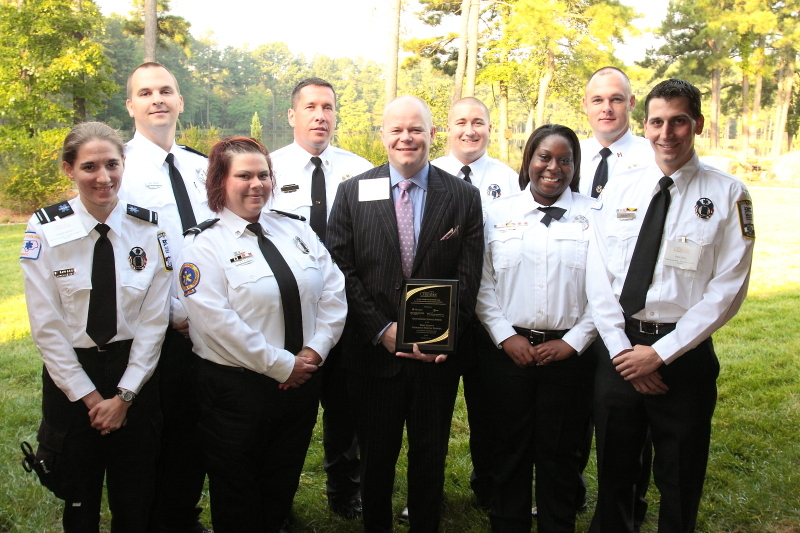 Eight Wake County EMS members were recognized for outstanding service on Friday, September 28, 2012 by the Raleigh Chamber of Commerce at their annual First Responders Appreciation Breakfast. The EMS crews responded last January to a complicated double premature child delivery and ended up caring for simultaneous newborn cardiac arrests along with caring for the delivering mother. The crews navigated through complex treatment protocols with very high stakes, and their tireless efforts paid off. Today the mother and both babies are healthy and strong at home. Congratulations to Paramedics Pete Gitto, Kendra Hicks, Beth Staley, Bridget Mulder; EMTs Hunter Crowder and Allen Beach, APP Chris Gherardi and District Chief Donovan Welsh on the recognition of their prompt, compassionate and clinically excellent care. Skip Kirkwood, Chief, Wake County EMS Division, announced today the promotion of Mallory J. Ballance to the position of District Chief, effective September 1, 2012. Gov. 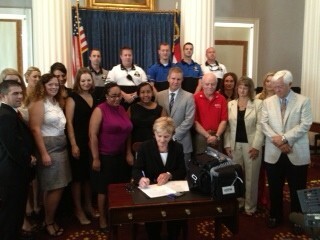 Bev Perdue signed House Bills 837 and 914, Thursday, July 26, 2012, that will save lives in North Carolina. House Bill 837 requires high school students to learn Cardio Pulmonary Resuscitation (CPR) and the Heimlich maneuver, as well as pass a test showing that they are proficient in both. The bill will become effective for the Class of 2015, and they must pass the test to graduate. Wake EMS’ 100 day campaign is centered on teaching the value and importance of AEDs and CPR. The point is to make people less afraid of hurting someone or being liable for any poor outcomes, to make it easy to shop for and purchase an AED and get training and to register the AEDs so that information on the exact location of the AED can be given directly to 9-1-1 callers when they need them most – during an emergency. This is particularly pertinent to the Wake County EMS System. Over the last decade Wake County has lead the dramatic development of the most successful cardiac arrest outcomes in emergency medical systems, yet we’ve been able to have those successes in a community of relatively low bystander CPR rates. Increasing bystander CPR and public access to AEDs may be one of the most important areas of focus for further increasing success rates and making sure no one dies from cardiac arrest unnecessarily. Wake County’s Advanced Practice Paramedic Program (APP) is explained in this article in JEMS. The article discusses how the APP program, along with others across the nation, are working to improve healthcare.